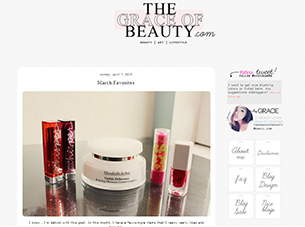 Grace is really beautiful and so is her blog. She mostly writes about beauty (reviews, favorites, etc.) but she also posts DIYs, tips, ideas, and general lifestyle-related bits. Her blog is highly aesthetic, she has great photography and design. 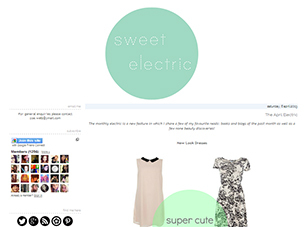 She also offers blog designs in case you’re looking for a blog makeover. Zoe’s blog is one I’ve been visiting for quite a long time. She’s very beautiful and sweet. I love reading her makeup reviews. Her blog has a little bit of everything although I think the best way to describe it would be a UK Beauty and Fashion blog. I’ve been reading Catherine’s blog for a while. I think the first post I ever read was on her engagement (she got engaged at Disney, super lucky!! OMG!) Anyways, she’s very lovely and writes about beauty. I get a lot of inspiration from her posts, there’s reviews, nail art, makeup looks, celebrity posts, etc. 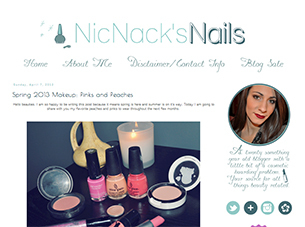 Nic is a gorgeous girl who posts about the loveliest nail art and nail polishes. Her blog will make you want to do your nails! She also posts about beauty (reviews, favorites, makeup looks) so there’s really good variety. Hello, lovelies! Today’s post is all about showcasing the lovely bloggers that have been advertising with me lately. I’ve just started offering advertising recently. You can read more about it here if you’re interested. These are the first group of girls that have advertised with me (so exciting!) and I assure you their blogs are very lovely! Please check them out! Hope you find some great new reads among these! Have a nice week! I just followed Grace. 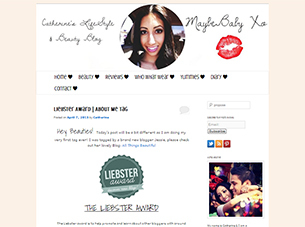 Her blog is gorgeous! hey coco! I saw you gave a shout out to my blog on twitter! thank you so much! that was really sweet and awesome of you (: i shall have to check out these blogs- thanks again! I've never heard of any of these blogs so away to have a godo read now! Wow thanks for listing these – I love finding new blogs to check out! I LOVE LOVE LOVE posts like this!! really helps me find some great blogs, I follow absolutely loads of blogs but I think a lot of them are inactive now! These blogs are great! especially the first – just had a browse through her blog, it's so good! I'm loving Grace's blog. I agree- her photography is amazing. I have found quite a number of nice blogs from your blog which is uber helpful. I don't have the patience to find them on my own. Also, love that you seem to have a heavy focus on UK blogs which on average tend to be really good across the board. Thanks! Really great bloggers. I love the way you advertise. This is a fantastic post I love that you are more than willing to help fellow beauty lovers out and make them known to others. This is amazing. Love love love this blog.